BREATHING – what about it? What’s all the excitement about? Breathing seems to be in the paper a lot recently. The Sunday Telegraph recently ran an article about the importance of learning to regulate the breathing pattern, by breathing more slowly. The journalist recommended a clinic in the USA where you can have your Carbon Dioxide measured to discover how serious your breathing problem is. But you don’t need to go that far! I use this equipment on every patient with a breathing pattern problem. The subject is endlessly interesting. The most important reason to learn to improve your breathing is that it will soothe anxiety, and other ‘high adrenaline’ problems. But it will also open the doorway to improved health in general…. Why re-train your breathing pattern? Learning to breathe mindfully will…. Enhance your health and mind control…..
Reduce the chances of more serious disease. If your breathing pattern is causing abnormal body chemistry and concurrent stress-hormone addiction – which is common – then the normal control of healing and restorative processes (including immune system function) will be compromised. Ill health results. Why can attention to breathing produce all these changes? Because it is the route into the unconscious control of the body-functions, the survival functions, the fight-flight system, the stress response. Furthermore, a persistent stress response disables effective bonding and ‘social engagement’ (a normal side-effect) therefore soothing the stress response enhances the ability to relate to others. Breathing is the only fundamental survival instinct that is available to our conscious minds to influence. Training the breath re-educates a special part of the brain that can regulate and control the mind and body. Breathing training will enhance the response to suggestion – if you’re using NLP, Mindfulness, Hypnotherapy, affirmations, Somatic Experiencing and other nervous system-training techniques. 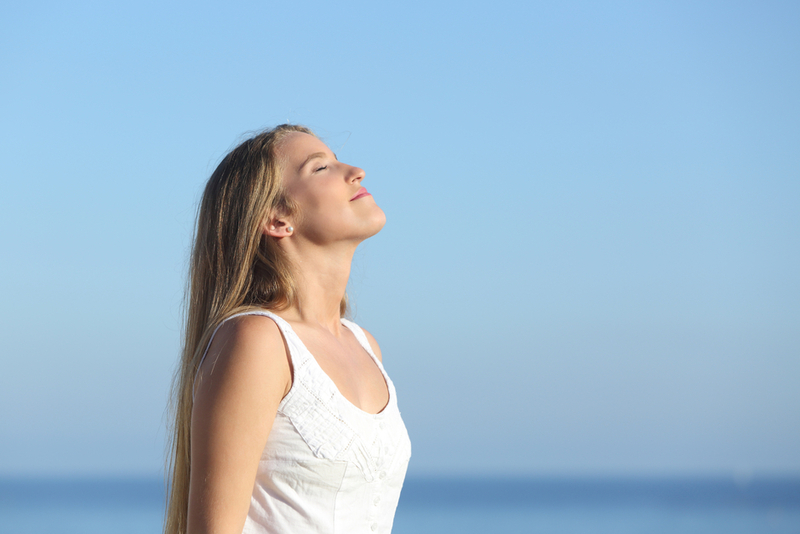 Learning to re-train the pattern of breathing is the most reliable way to reduce anxiety. Breathing is the most primitive survival instinct. So when breathing malfunctions, so fear and anxiety can appear. This is why ‘panic attacks’ can feel like an inability to breathe enough. If you soothe your breathing disorder, you will soothe your own brain’s anxiety/adrenaline habit. Pretty much everyone who has an anxiety problem has a breathing pattern disorder (ie, they breathe wrongly). I have never met an exception to this rule. Most anxious people over-breathe. And over-breathing feels like under-breathing. Hence you feel like you’re ‘out of air’ when you’re not. So you continue to over-breathe – and the problem perpetuates itself. Breathing poorly profoundly affects the body because it changes blood chemistry – read on if you’re interested! If you over-breathe (that is, breathe in excess of requirement – which is what anxious people do because their brains are preparing them to fight or flee) you deplete the blood of carbon dioxide (CO2), because you breathe it out too much. (It’s not possible to breathe in too much oxygen). This causes a tendency to ‘respiratory alkalosis’ – a ‘pressure’ on the blood to provide enough acid to balance the excess of alkali left after over-breathing. To ease this pressure, the kidneys respond by excreting ammonium ions to reduce the amount of alkali in the blood, in an attempt to balance the acid loss. The result is an overall depletion in a variety of blood chemicals whose job it is to keep the pH steady at times of stress and exertion. This is the key; the ability to ‘cope’ with anxiety is reduced. The blood easily tips into an alkali state during stress because of sudden extra over-breathing. Un-buffered alkali in the blood releases chelated (stored) calcium ions that over-excite the nervous system in an astonishing variety of ways, producing symptoms of anxiety and stress. It is impossible to relax well with a low carbon dioxide level in the lungs and blood. Therefore it is necessary to learn to breathe in a way that restores the normal blood chemistry. This creates a normal baseline operation of the nervous system – a good starting point for other forms of therapy. Much anti-anxiety therapy fails because the altered blood chemistry will not allow a relaxation response to be achieved. I can teach you how to re-train your breathing.